Sandra Kaye: My House is all Dressed Up for Christmas!!! 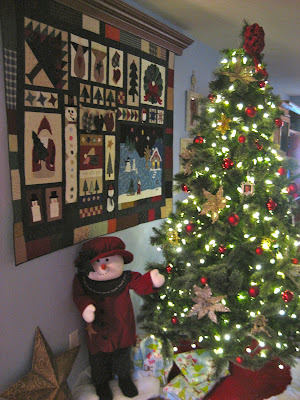 Today is the opening for the 2011 Christmas Quilt show over at Sew Cal Gal's. Here is my Christmas entry for this show. Be sure to pop over to see the rest of the Christmas entries. The show is running from Nov 28th - Dec 2nd. I don't have many project pictures I can show you. They are all Christmas presents. And my family and friends read my blog.... so I decided to show you my decorations. Here is tree number 1. I made this quilt years ago. 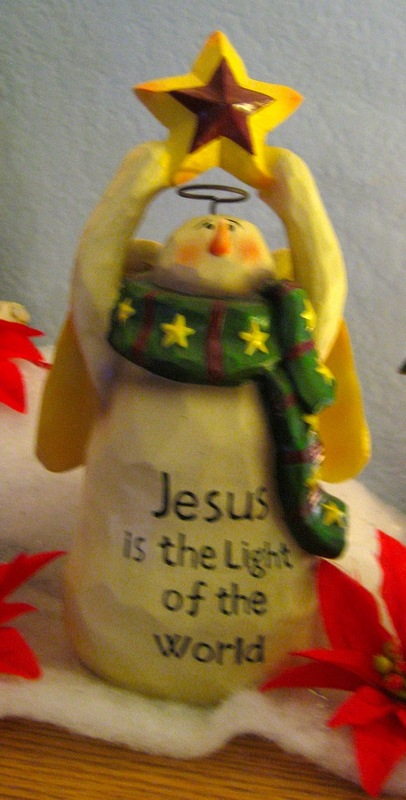 I put it up every Christmas. This is tree number 2 in my entry way. This quilt was made in a series of three. I gave the other two away to blog friends. Tree number 3. This is the child tree. All the ornaments on it are made by my kids. I have a collection of snowmen that I put out every year. Here is one of my favorite snowmen. My Mom bought him for me. I really love the Christmas season. Well, I'm off to quilt some more. I'm almost done..... almost!!! For those doing the Christmas Quiltie trade... How is it going?? Hope you are almost done. I have already received several sets in the mail....They are wonderful!!! This is going to be a great trade!! Sandie, you have made my day a Christmasy Day thanks to your sharing of the pictures of your beautifully decorated home. The quilt that you put up every year is spectacular! A project of love, I'm sure. The Merry and Bright is adorable and I see a few Jim Shore angels...don't you just love Christmas! it is looking so lovely..i love all the sweet decorations so much. Your house looks gorgeous! Everything goes together so nicely! I am starting to decorate a little at a time. I'm still recovering from Thanksgiving!! You have a beautifully decorated home, and your quilts are gorgeous. I love the images on both of them. Your "Merry and Bright" wall hanging is beautiful. Your home is lovely! And the quilts are too of course. Very pretty. Can I come live in your house? Oh my goodness I put up three trees this year too! Just love yours and adore how homey and bright and pretty everything looks. I can tell you had fun! I love the little glimpses (a word?) of Christmas thru out your home! I would like to do that too, but how do you do it as one post? Wonderful pictures of a warm and cozy Christmas. Love your quilts too. My stuff is still in the attic.Ouch..
All your quilts a gorgeous. Your home looks like your ready to celebrate today! Are we going to get a peek at your Christmas gifts once the new owners have them? You know that enquiring minds want to know!! :-) Great blog you have! Beautiful Christmas Quilts! Thanks for sharing! What a beautiful way to decorate your home! Love the decorations and wall quilts. Think the idea of a child's tree is super and will have to start one of those with my grandies. Your decorating is lovely. I love your Christmas quilts. Your house looks lovely with all the decorations. And I do love the quilts you have shown. Beautiful work! Everything is so beautiful and cozy! I looooooove all your quilts! My goodness what a festive show! I agree I want to come live with you :) Well if that can't happen, can you come to my house and decorate ;) Just wonderful, all the wall hangings and the blue and white quilt on the sewing machine is wonderful! Beautiful quilts Sandie. I love all of your trees and especially the children's tree as all of the decorations are made by your kidlets! Awesome! Beautiful quilts you have made to put up in your house! What lovely Christmas decorations you have. Beautiful quilts! Darling trees. I love your quilted creations!! I'm your newest follower and look forward to future posts. Your house looks so inviting with all the lovely wall quilts and decorations! Beautiful! How warm and inviting your home looks, your wall hangings are amazing. Love the sampler, and all the others too! I really love both of your wallhangings. I have *got* to finish my Christmas wall quilt!! I thought I left a comment here when you first put this post up, but apparently I didn't. I think it's so cool that you have trees throughout your house! Beautiful wall hangings! I really love them both! And how special to have one part of the set of 3 wall hangings knowing that others are enjoying theirs and thinking of you as you are thinking of them. Hi Sandie! Beautiful Christmas quilts! Wow, you really go all out. We've often talked about doing more than one tree - I'd love to have trees everywhere! Everything is looking so nice. Hopefully we'll be putting our tree up this weekend. I love bringing out all our Christmas decorations. Thanks for sharing your wonderful Christmas trees and quilts! I especially like the first sampler one. I don't think I've seen this pattern before. Happy Holiday to you! What beautiful trees. I love in particular the Merry & Bright hanging. Your Merry and Bright is my favorite. Very nice! Your house looks so Christmasy! Love the Merry and Bright wall hanging and all your other wonderful decorations. I love Christmas and The quilts are Beautiful! Wow! You really Do like Christmas!!!! Thanks for sharing so much! I am going to email and join your quilt trade! Your house looks so festive! All of those pretty quilts out where everyone can enjoy them. Wonderful Christmas quilts. Your home looks lovely. Beautiful quilts! Thanks so much for sharing them!! Both quilts are beautiful! I could either of them decorating my house too - just my style! I think both quilts are beautiful. Thanks for sharing them! what a great idea to show the quilts by showing them in their "native environment." Every quilt is wonderful. Thank you for sharing. Wow, do you look great all dressed up! Your Christmas quilts are spectacular. Love them all. Thanks for sharing in the Christmas Quilt Show and helping to make this event so fun. I too have a children's tree. Love your little wall hanging quilt. Sandie!! I was here before - unfortunately on a night that my internet was acting up - so no comments from me. I love the trees through-out the house! Festive! Great work - I love the way you hang the quilts. BEAUTIFUL! I love this post!! !